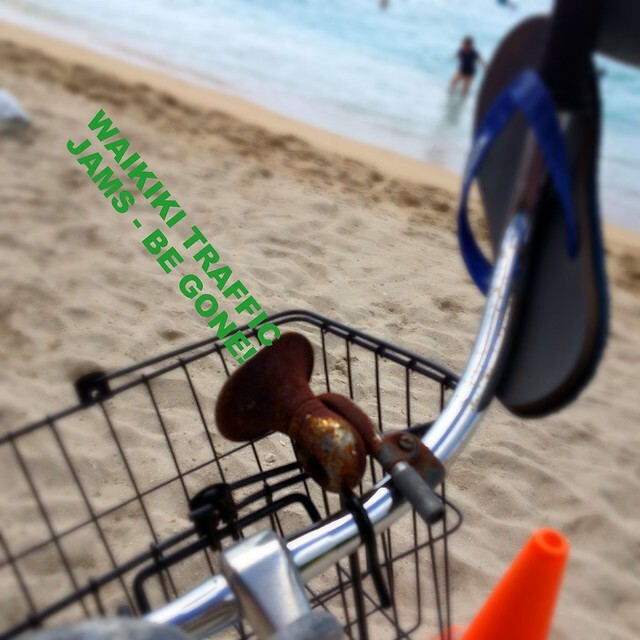 BikeCommuters.com > Articles > News: Traffic Backup in Waikiki Calls for More Bikes! I have driven to Waikiki exactly once in… 3 trips to O’ahu, and that is when Mrs. A and I were there with my parents in ’07. The other times, it was all TheBus (Mrs. A was living out past He’eia Kea) or we were staying in Waikiki itself (par-tay!). Parking there was a total mess back then and I cannot imagine that it has improved. Now, if they’d had bike share in ’04 when Mrs. A was living there, we might have had a more awesome visit, as it was we were too far from the usual sights and only had one bike between us, so it was all TheBus all the time that trip. What is it about these tropical climates that keeps people off their bikes in droves? Same thing with Florida, or SoCal, or a dozen other places…you can ride all year, and traffic congestion is a nightmare. So why not get on two wheels and beat the gridlock? @ Ghost Because A/C is awesome. Not that I’d know, the A/C been out in the car for years. Blame machismo car culture! Plenty of people cycle in triathalons (Ironman in Big Island) but fear the commute and the sweat! In a word: Sweating. Apparently it matters to some people.